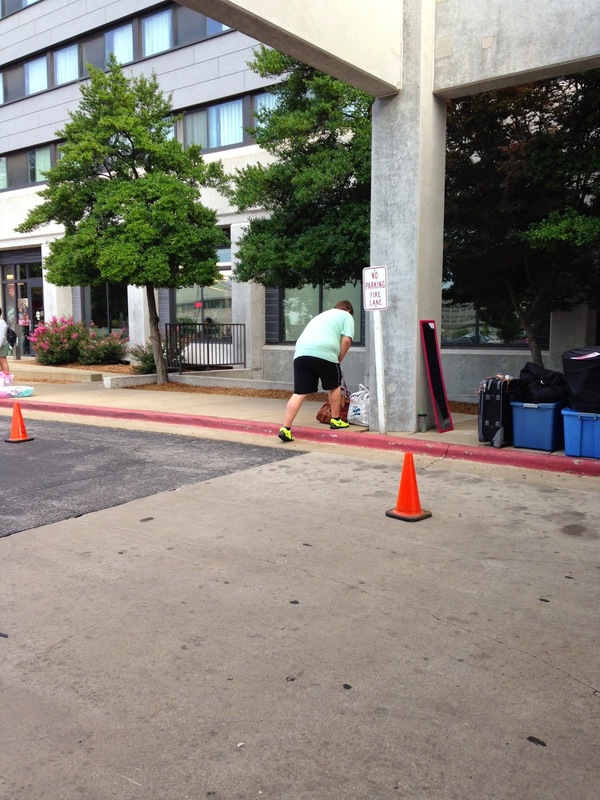 Today was Move In Day at Missouri State University. We left Nevada, MO (from my parent's home) at 6:00 a.m. Well, we were suppose to leave at 6:00 a.m. However we got off to a late start as William forgot to print the parking pass before he disconnected the Internet so he had to go down to Granny's house to use her computer; which was out of ink so they had to go to Walmart to get some. We didn't leave town until 6:45 a.m.
William wanted to get an early start and get there before his roommate did. We haven't met the roommate so this could be interesting for William. 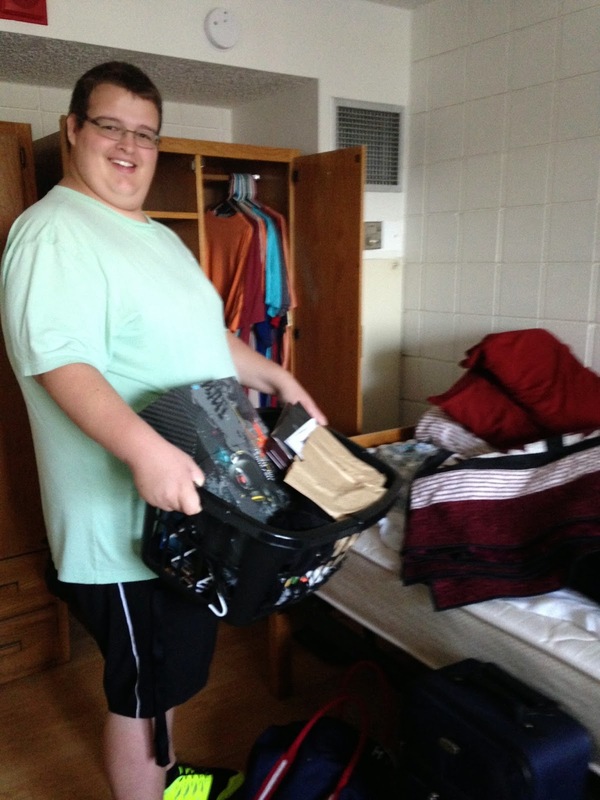 He wanted to get there and arrange to room like he wanted and put away his things first. We didn't end up re-arranging anything once we were there. We were quite impressed with the unloading process. It went very quickly, and smooth. There was plenty of help to take the huge pile of things up to the room. And here we are all settled in. Look closely. It will not look like this in less than 24 hours! I hope his roommate is not a neat freak. On the other hand, maybe if he were, it would rub off on William. I made him both of these quilts for Christmas. 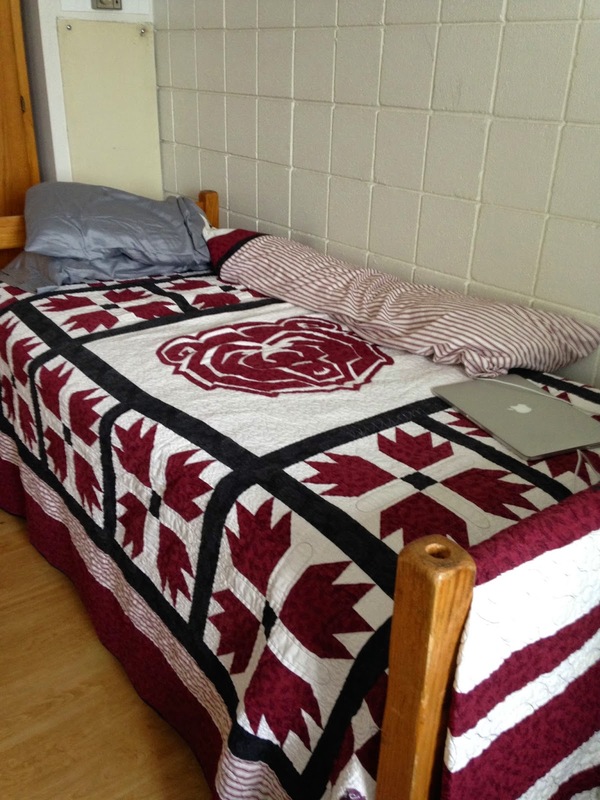 The one on the bed is a Bear's Paw and I appliquéd the college mascot in the middle. You really can't see the one on the end of the bed but it has the bear appliquéd on it too along with his name in large black letters. William finally got to meet his roommate late this afternoon but we haven't. He thinks they are going to get along just fine. He is a computer science major and a "League of Legends" player too. So far it hasn't hit me that I'm leaving my baby at college and on Sunday will be going back to Texas but I can assure you it WILL at some point. It is a big step for sure for both of you. That's a gorgeous quilt on his bed! Great colors! Aren't those tiny rooms kind of fascinating? Last year my daughter's roommate was a slob. This year my daughter became an RA and has a room to herself. You are so fortunate all those stores were nearby. We had access to a Walmart, but all the others were about 100 miles away! Since we are into our second year, I still really miss her, and she is awful about phoning, but I'm handling it a lot better. I hope you adjust fairly quickly too, because those first weeks can be pretty awful! It is hard when our babies grow up and try their wings on their own. Love the quilts and William will be able to wrap himself in a hug from mom whenever he gets homesick! Hang in there, it does get better!